Sadly, Perth is often the forgotten city of Australia. Why? It sits on the south-west coast of the country and owns the title of being the most isolated capital city in the world. Don't mistake this isolation for boredom, though. This western city is located along one of the most beautiful coastlines in the world, making way for endless water-based activities and stunning sea views. The best news? With its amazing summer, spring and autumn weather, every day is a wonderful day to explore picturesque Perth and its impressive surroundings. 5 of the best things to do in Perth! 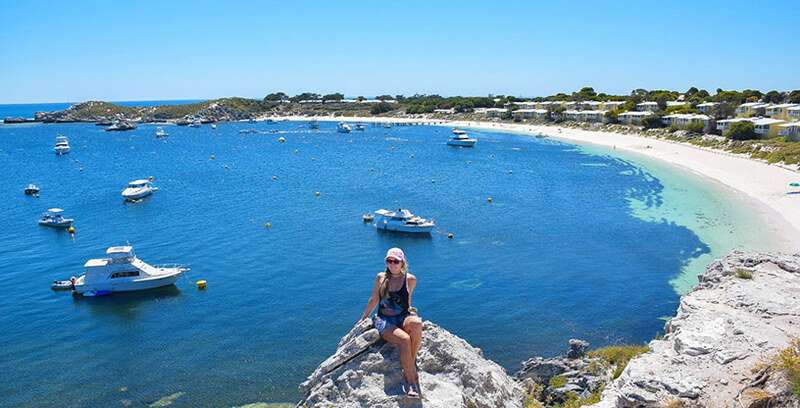 Going to Perth without visiting Rottnest Island is like going to Paris and not seeing the Eiffel Tower. This pristine island 20km off the coast of Perth is both a favourite among locals and tourists. It boasts stunning secluded beaches, a unique wildlife, world-class snorkelling and diving, and that laid-back island vibe Australia is famous for. You can visit the island on a day trip or spend a few nights. Rottnest Island has one bus route to get around but the most popular mode of transport among visitors is by bike. Once you’ve hired a bike, you can head off and explore every bay, beach, and attraction at your own pace. And if you’re lucky, you may even capture a selfie with some quokkas – the island’s native marsupial residents – who are as friendly as they are cute. Looking for some more picture-perfect locations? Find out out Perth's Best Instagram Hotspots. North of Perth is the Swan Valley wine region. Although this boutique wine region is small, the wines made here have left a lasting impression on wine drinkers worldwide. The entire valley is filled with amazing boutique wineries offering unique wine tasting experiences, including Mandoon Estate, Jarrah Ridge Wines, Olive Farm Wines, Ugly Duckling Wines, and Harris Organic Wines. The regional specialities are Verdelho, Shiraz and Cabernet varieties, so it doesn’t matter if like a good white or red, you’ll be at home in this wine region. Unsure whether you need travel insurance to travel to Perth? Check out our Domestic Travel Insurance FAQs here. However, there's more to the Swan Valley than wine. In fact, the region is also home to a chocolate factory (that offers free chocolate), a nougat factory (with free nougat), and a few cheese factories (that also offer tastings). If your taste buds are tingling at the thought of these delectable treats, check out Whistler's Chocolate Company, Mondo Nougat, and The Cheese Barrel. How do you get there? The Swan Valley is only a short 30-minute drive from Perth’s city center, so you can visit in a hire car or join one of the many different organised wine tours. Perth’s coastline is one of the best in Australia. Long, white sandy beaches that go as far as the eye can see, crystal clear, sparkling blue water and spectacular close-to-shore snorkelling are just some of the reasons no trip to Perth is complete without a day (or a few) at the beach! According to Perth locals, some of the most popular and stunning beaches are Cottesloe, Trigg, and Scarborough. These beaches are all gorgeous in their own right, and all come with their own unique attractions. These beaches can be extremely busy in summer, but it’s best to embrace the chaos and “Western Australia vibe” for a truly cultural experience. For a less busy day at the beach in Perth, I love driving along the coast and stopping at any number of the more secluded spots I find along the way. Because if there’s one thing for sure, it’s that Perth is not short on amazing beaches! If you're only taking carry-on luggage to Perth, make sure you know these cabin bag essentials! Kings Park is the most iconic park in Perth. Overlooking the city, Kings Park is in an ideal location for tourists as it is easily accessible from the city by foot or by car. This large, extremely well-maintained garden and nature reserve is a great place to read up on the city’s history on the many memorial plaques, explore the many gardens and watch the sun set behind the city. During the day, people wander across the tree top walk that takes you high above the forest floor and into the top of the tree. Make sure you do this walk if you’re after even better views of the Swan River wine region and surroundings. At sunset, it's very common to find small groups of friends and family enjoying a picnic on the grass overlooking the city. So, if you’re after a relaxing day or evening, Kings Park is the perfect place! Perth is actually home to more than one island, and following close behind Rottnest for the title of must-visit island is Penguin Island. Penguin Island is exactly as the name suggests: an island that’s home to lots of cute penguins! Penguin Island is only 45 minutes south of Perth, making it an easily accessible day trip activities for tourists. It’s a short 10-minute ferry ride off the shore of Shoalwater Bay, with ferries departing the bay every hour. Once on the island, you can wander around on the many boardwalks and trails with the hope of spotting some blue penguins in the wild. The penguins that occupy Penguin Island are known as Blue Penguins. They’re the smallest species of penguin – growing to an average of 33cm in height and 43cm in length – and are easily recognisable because of their slate-blue feathers. If you don't manage to spot them in the wild, the island is home to a Discovery Centre where 12 rescued Blue Penguins call home. In the Discovery Centre you will get to see the playful penguins up close and learn all about their life in Perth. Added bonus: Penguin Island is also home to a number of other wildlife species, including sea lions and dolphins. If you’re a lover of ocean animals, checking out this protected nature reserve is a must! Perth is home to one of the most interesting and stunning backyards in the world. It is a place where the city and nature are in balance; where you can enjoy Australian culture and wildlife without sacrificing comfort or pleasure. And now I’ve shared all this beautiful region has to offer, all that’s left to do is book your ticket! Heading over to Perth? Consider Domestic Travel Insurance to protect your adventure. Daniel is an Australian born and raised in Perth. However, he hasn’t called Perth “home” in over four years because he has been too busy travelling the world with his partner Bailey! They love exploring the globe and learning about new cultures together. You can follow Daniel and Bailey on their adventures around the world via their Instagram account Destinationless Travel.